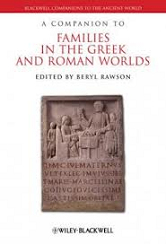 A Companion to Families in the Greek and Roman Worlds draws from both established and current scholarship to offer a broad overview of the field, engage in contemporary debates, and pose stimulating questions about future development in the study of families. Provides up-to-date research on family structure from archaeology, art, social, cultural, and economic history. Includes contributions from established and rising international scholars. Features illustrations of families, children, slaves, and ritual life, along with maps and diagrams of sites and dwellings.